If you are not familiar with the legislative process, it is not as democratic as most people imagine. Both the House of Representatives and the Senate have Judiciary Committees. A bill can start in either committee, however, each committee has a Chairman. The Chairmen actually filter what bills the other committee members will even see. For example in Pennsylvania, Senator Stewart Greenleaf has been in control of all of the court reform introduced by the Senate, for approximately 25 years. In the House, Representative Ron Marsico controls which proposals for court reform, will be presented to the other Representatives. As a result, there has been no meaningful reform and the courts continue to deteriorate in every way. This process itself is ripe for change; this is way too much power in the hands of just two people. Removing the monetary incentive in the system is key. There should not be a price on justice. 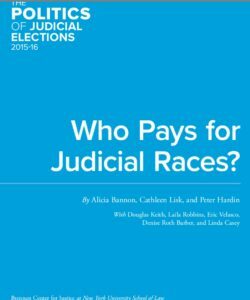 Currently, judges are complicit with the prolonging of cases, to maximize hourly billing in repayment to lawyers who have contributed to their judicial campaigns, either individually or through PACs organized by the bar association. The changes in the table below, will most certainly interfere with this racketeering practice. The current system is not a justice system – it is a commerce system. It does not provide due process. The below is a list of reforms that will drastically reduce the injustices now being inflicted on the public by court personnel, judges and officers of the court (attorneys). Inform your elected politicians that you expect similarly focused House and Senate bills to be introduced, to end the racketeering currently rampant by opportunistic lawyers, and responsible for unjust incarcerations, being facilitated by judges. Your local Senators and Representatives need to know you are aware of the problems emanating from the Judicial Branch. These changes will maximize the integrity of our courts. There are many other changes that need to be made, but the below is a good start to putting our elected officials on notice, that the public is retaking control of our third branch of government. It only takes a stamp. Please sign and print this out , and send to your State Representatives and Senators – or make an appointment with them and hand it to them personally. Elimination of absolute judicial immunity – judges must be subject to the same laws as every citizen, for the violation of the civil rights of any person. The Judicial Conduct and Attorney Disciplinary Boards must eliminate all members of any bar association, and be more representative of a cross section of the public. The Judicial Branch must comply with the Freedom of Information Act and Sunshine Act, to be brought back under the checks and balance system. Remove the word “may” from the court procedural rules, replacing it with “must” or “shall” to minimize abuse of discretion by judges. Removal of the bar associations as the attorney licensing authority. All licensing should be through the State and not the private “non-profit” organization of the American Bar. Eliminate ALL local county court rules. ONE set of court rules that are easily accessible and apply to every county is necessary to simplify the process. State regulation of attorney hourly fees. A cap of 40 hours per week of total billing charges, with no overhead fees- must be implemented and enforced. Elimination of the Supreme Court as the ultimate arbiter of the punishment. The Conduct Board is supposed to be an “independent agency” separate from the court. This authority can be transferred to the General Assembly, who already handle the impeachment process. Pro Se (self-represented) Litigants must be made a protected class. Discrimination by the judiciary must be strictly monitored and prohibited. Four year term limits on all judges – every level – to coincide with the election of the Governor. Mandatory limit on all court cases of ONE YEAR – violation by Judges will result in the docking of judicial pay if, after citizen panel review, it is found that no justification exists to exceed that time. Court costs should be State regulated and whenever possible, there should be no charges for filing. The court employees are already paid through your tax dollars. Prohibition of campaign contributions by lawyers, law firms and politicians to judicial election candidates. Elimination of anonymous contributions through PACs. Video cameras in every court room and copies available by agreement of the parties.